This loop trail is about the closest thing I have seen in AZ that resembles the Colorado Rockies. You start the trail in Ponderosa pines, but end in Douglas firs with Aspens all the way. You will also notice that the Aspens in the lower elevations are very white, but as you gain in elevation the bark goes from light green to khaki. The trail starts from the end of a parking loop, which has more than enough space for the few people that seem to use this trail. The route is always well define and maintained. After you go a short distance you come to a trail marker with a register. The trail signs indicate Bear Jaw Trail to the left and Abineau to the right. 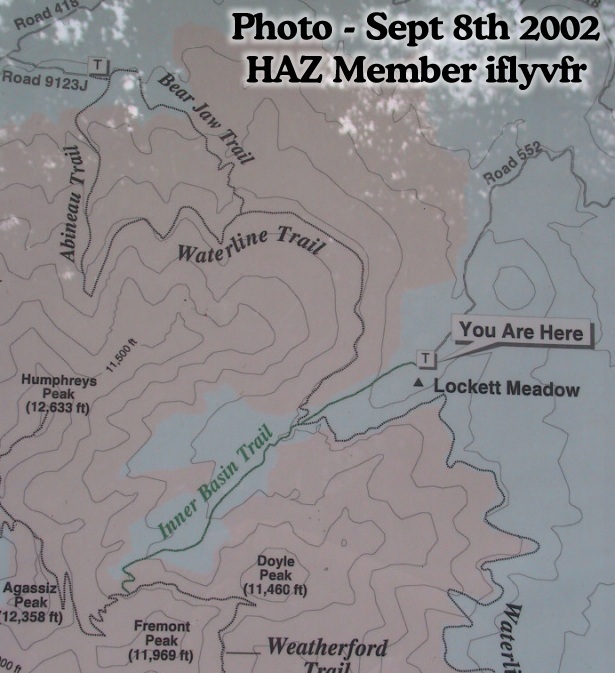 Considering that your goal is to reach the highest point that passes a meadow looking up at Humphrey's Peak, you can go right on the Abineau trail which is shorter, but is also much steeper. 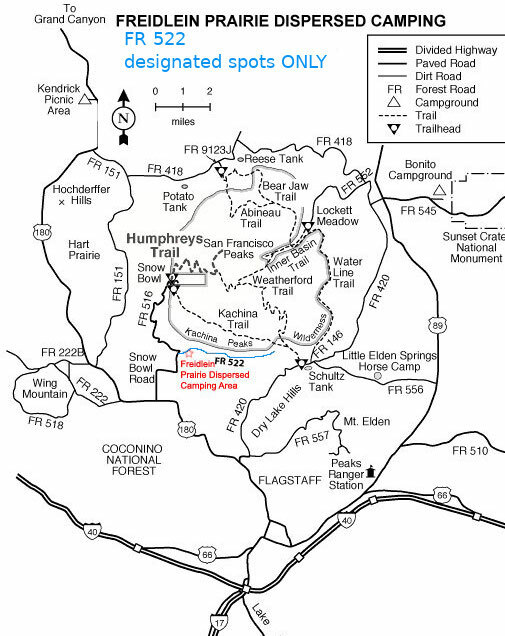 Or you can go left, up the Bear Jaw trail that is longer but the ascent is more gradual. I when the to the left and came back using the Abineau trail. Doing this on Memorial Day there were just a few patches of snow. I crossed a small snow field at the meadow, but returning on the Abineau trail was a bit risky because with the steep decline in places and being covered in ice and snow made it slippery. The only disappointing thing on the whole trail was that on that day the air pollution was extremely bad. So visibility, looking out to the horizon was very limited. But besides that, I would put this trail in my top 10. Stay off the mountain when thunderstorms are forecasted. July and August are notorious for quick unexpected storms. Lower the risk by being OFF the mountain before 11am on a clear morning. Stay safe, read the NOLS Backcountry Lightning Safety Guidelines. Coconino FS Reports From the Abineau and Bear Jaw trails, on the north slope of the San Francisco Peaks, you can see all the way to the Grand Canyon ninety miles away. These two trails provide a scenic loop hike through forested canyons. Both lead to an old road that runs along the base of a long talus slope topped by Arizona's highest point, the summit of Humphreys Peak. The climb along either trail is steep and steady through stands of mixed conifer and aspens. The road completes the loop by providing a connecting route from the top of one trail to the top of the other. From this high perspective the Grand Canyon appears as an wide gap in a broad plateau that stretches from the foot of the mountain to the horizon. This route passes through an area that is colorful at all seasons of the year. In late Spring, alpine wildflowers such as lupine, rocky mountain iris, penstemon and paintbrush color the trailside meadows. Sunflowers add a slash of yellow in Summer and groves of aspen paint the slopes with crimson and gold during the Fall. There is a chance to see a black bear here-perhaps the best chance you'll have in the area around the Peaks. Seeing sign of these big shy animals along either trail is not uncommon. Mule deer and elk are also plentiful. Common birds are juncos, Steller's jays and Clark's nutcrackers. In Spring and early Summer the forest's best singer, the hermit thrush, will serenade you along your way. From Flagstaff, head north on SR 180. Follow about twenty miles to the second turnoff for FR151 at mile marker 235.2 FR151 is Hart Prairie Road. This is a great loop to drive in the autumn. You can see aspen leaves turn golden yellow alongside the road. Anyhow back to task, follow FR151 just over a mile and a half. Take a left on FR418. Follow just over three miles to FR9123J. Turn right onto FR9123J and follow just over a half mile to the trailhead. The parking is area is large. There is a small walk to the trail signage, but it's within view. On the drive in I noticed several homes along the way, must be nice! Misubri writes: From Flagstaff go north on US Highway 180 for approximately 18 miles. Turn right on Forest Rd. 151 (well maintained). Then continue 1.6 miles and turn left on Forest Rd. 418. Drive 3.1 miles to the signed turnoff for Abineau Trail. Turn right and go .3 miles to the trailhead. You can also reach the trail head by going north on US Highway 89 and instead of turning right into Sunset Crater National Monument, turn left to come to Forest Rd. 418. Then it is about 8 miles to the trailhead.